Contraire to popular belief, I do actually clean my house, it just happens to be low on the to-do list, especially this time of year when I’m up to my elbows in produce (just had a bag of zucchini and another one of cucumbers dropped off as a matter of fact) that needs to be dealt with. I prefer to use as little chemicals as possible in cleaning my house – even when I’m not pickling everything in sight, I go through a substantial amount of vinegar on a regular basis. I use it to mop floors, in my laundry in lieu of bleach and fabric softener (and no, our clothes do not smell like vinegar as a result) as well as to spray down the showers after using them to help keep the funk at bay. Until last week though, I’d never attempted to make my own furniture polish. I don’t know why, I guess I was skeptical about it. Or maybe just lazy. However, in the midst of an impending thunderstorm last week with guests due to arrive for the weekend, I found myself lacking a vital cleaning supply, so I decided I’d try making some myself rather than risk running out in the rain. (I might melt you know.) Turns out making your own furniture polish is ridiculously easy, smells way better than anything you can buy AND I swear, my furniture is much happier for it. It didn’t fix all that was wrong with our rather beat-up coffee table, but it did help smooth out some of the marks, most notably that one from the tequila shots last summer that left a mark, and significantly lessened some others. 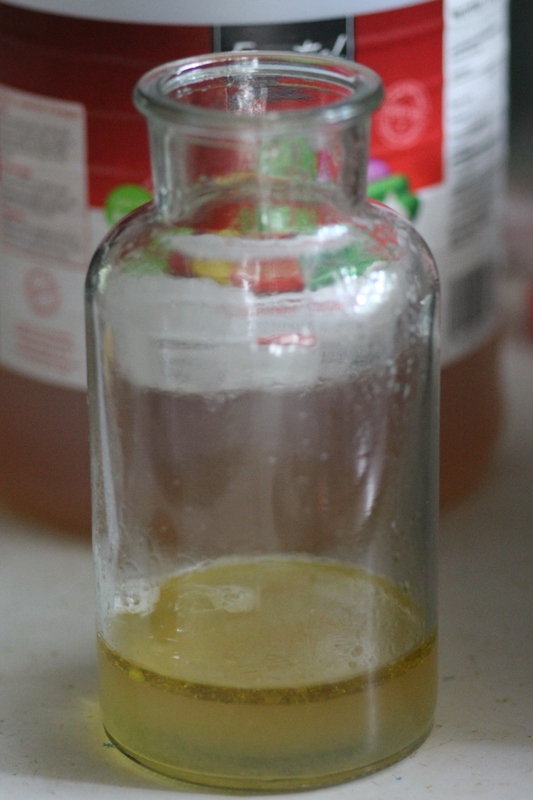 I did some quick reading on the subject and decided to go with more vinegar than oil – the vinegar is what cleans the furniture, the oil keeps the vinegar from drying it out. Because most of my wood is dark, I used cider vinegar – I read it can stain lighter colored wood – which I also prefer the smell of over white vinegar. I read about using essential oils – which can be pricey – to scent it, but I also read you can use fresh lemon juice, so I went with that. I was worried that such a little batch wouldn’t go far, but it goes farther than you think. This particular batch polished the living room end tables, chair and sofa legs (I was on a roll y’all) as well as cleaning up various other pieces of furniture in my current full house re-org (which is another blog post) involving Edie’s room, the so-called happy corner (aka, my sewing and crafting nook) and the den. I really feel stupid for not trying this sooner. Shake to combine. To use, dab on a clean cloth and wipe furniture. Cool! I will try this and then, if I have any left over, I will use it on my salad! That’s exactly what my husband does. Okay, I AM impressed. When I run out of Murphy’s Wood Soap I am trying this. I’m telling you, had the sky not been black with an impending storm, I wouldn’t have tried it, I’d have gone to buy a can of furniture polish. Brilliant! I will definitely try this. I wonder what it will do for veneer? I have this crappy desk from Pottery Barn (their furniture is the WORST) and the surface looks terrible. It’s got to be worth a try. It really did wonders for my beat-up coffee table!